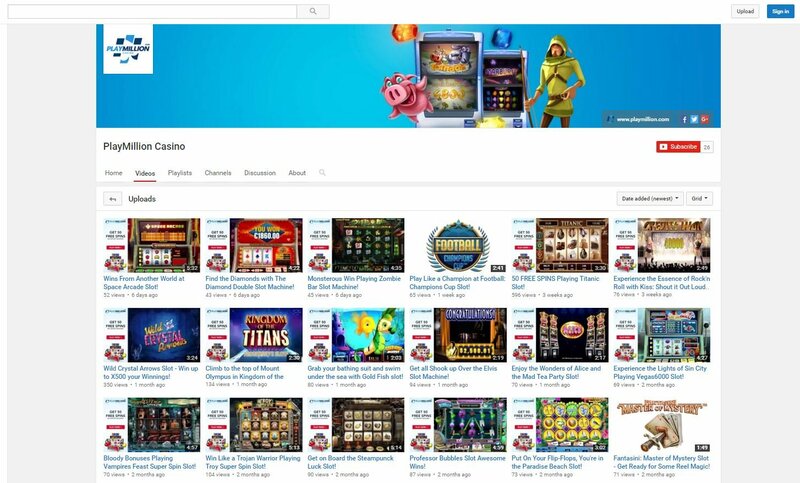 If you like watching YouTube videos and you love getting Free Spins, the official PlayMillion Casino YouTube Channel gives you both! This YouTube channel first came to our attention earlier this year (2016) and we were blown away not only by the incredible videos they post but by the super offers that they include along with them! At VegasMaster, we love watching YouTube videos, especially those of the online gambling variety. Surprisingly, it’s not always easy to find a channel like PlayMillion’s, where you can view a large batch of online gambling videos with quick ease. You can watch the latest uploaded videos or you can focus your experience by clicking on one of their playlists if you’re only interested in checking out a game from a specific developer (ex. NetEnt, WMS, SkillOnNet). Since discovering PlayMillion Casino on YouTube, we have become dedicated followers of the channel and are continually impressed with the number of videos they publish and the frequency at which they release them. You get a first hand glimpse of the supreme iGaming entertainment you will experience as a player at this premium online casino. PlayMillion.com youtube channel is a great way to stay updated with new games, even if you are not a player of the casino. As players ourselves, we like to investigate certain casino games before we play them to make sure that there’s truth to the hype we’ve heard regarding newly released titles. The game videos on the Play Million channel provide you with all the information you need, giving you a perfect preview of the game’s design, atmosphere and special features. What makes this experience all the more exciting is the fact that you obtain all this information without having to spend a dime. It’s all 100% free. You can click here and subscribe to the Play Million Casino YouTube channel, but it's not a must in order to take advantage of the casino’s thrilling free spins offers. Simply click the “Play Now” box in the video and you’ll get 50 free spins upon registration with no deposit required! Now that’s what we call an interactive YouTube video! Check out the PlayMillion.com YouTube Channel for yourself and be sure to subscribe to the channel to get your first look at all the latest and hottest game releases!